Описание: Понимая, что подростки сегодня живут в быстро меняющемся, динамичном мире, управляемом новыми технологиями, УМК GoGetter предлагает учебные решения, ориентированные на мотивацию, вдохновение и развитие молодых умов в позитивной школьной среде. Пошаговый подход к обучению сочетается с мотивирующим мультимедиа, которое включает в себя аутентичные видео BBC и интерактивные действия, а наличие оценки для обучения, присутствующей во всех компонентах, означает, что вы можете быть лучшим, кем вы можете быть - станьте GoGetter! Партнерство с BBC способствует совершенствованию благодаря их высококачественному, образовательному и аутентичному контенту, который актуален и мотивирует подростковый класс. 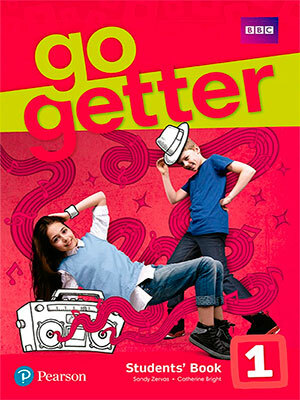 Understanding that teenagers today live in a fast-moving, dynamic world governed by new technologies, GoGetter provides learning solutions focused on motivating, inspiring and developing young minds within a positive classroom environment. A step-by-step learning approach is combined with motivating multimedia that includes authentic, BBC videos and interactive activities, and with Assessment for Learning present in all components it means you can be the best you can be - be a GoGetter! Extra Online Practice: motivating video-based interactive activities for every unit with extra language revision material and access to all videos and audio. - My English Lab: Interactive Online Workbook with different tools and functionalities available to students and teachers. - Student’s eBook: full Students’ Book in digital format with embedded audio and video material. - Active Teach: a front-of-class presentation tool available offline, with everything teachers need on one disk or one USB! - Teacher’s CD-ROM: available with the Teacher’s Book at each level includes class audio and video clips (with scripts), flashcards and extra teaching resources. - Practice activities in exam-style format are seamlessly integrated into lessons, providing students with practice so they can pass tests and achieve their goals. - The Workbook provides extra practice, plus additional online revision activities are available through Extra Online Practice. - The teacher's Test Book covers PTEYL and Cambridge exam-style tasks. Assessment for Learning techniques are presented in all components of GoGetter, enabling students to focus better, understand what they're learning and to be more involved in their learning process.